Are you finding it difficult to capture quality audio when making videos of sports events or family get together using deceives laced with iOS? Well if you do, you do not have to worry about it anymore as a portable mic has been marketed recently that will address all audio quality related issues. 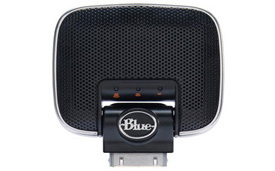 Blue Microphones - a California-based company has recently released Mikey Digital — a portable microphone for your iOS devices. The plug-and-play stereo mic promises to capture professional-sounding recordings for any videos you shoot.